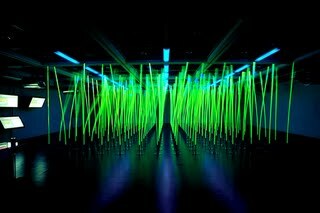 Makoto Sei Watanabe, creator of Fiber Wave, classifies the project as a work of environmental sculpture. Illuminated by the sun. Animated by the wind. This one was made for the great outdoors. There's also an indoor version of the work for you less outdoorsy types to enjoy. Click on the photo below for information and photos of Fiber Wave 2.